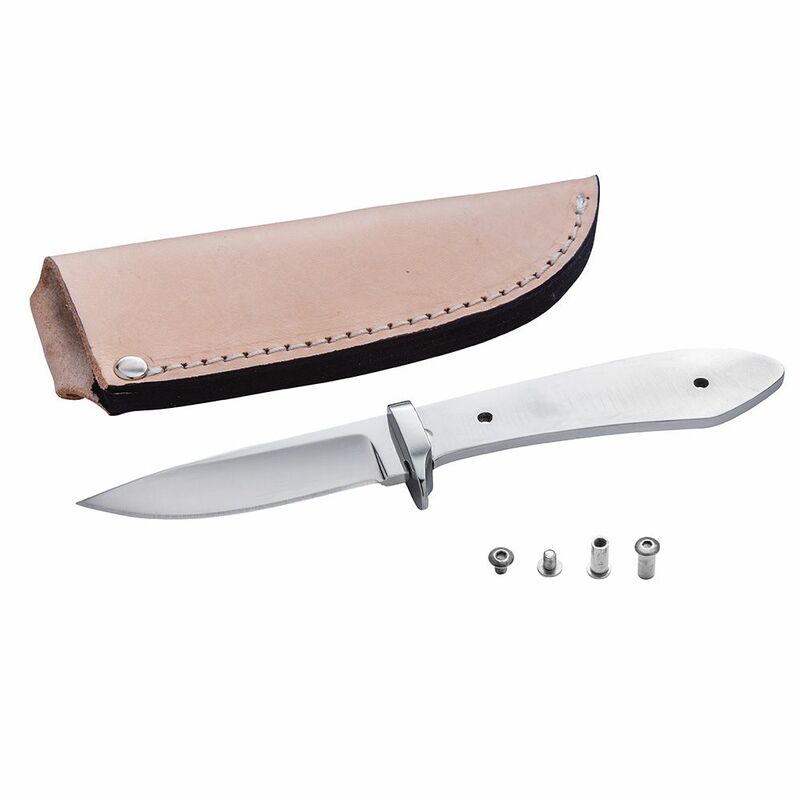 A sturdy, compact bird knife with a genuine leather sheath—made from top quality 440C stainless steel! 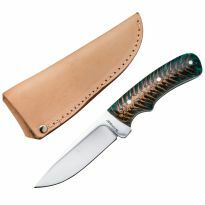 This little fixed-blade bird knife is the perfect sidekick for small game hunting and bird hunting. 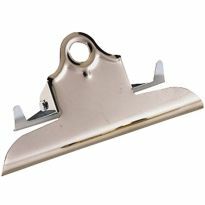 Just add a pair of scales in the material of your choice to complete the customized handle. 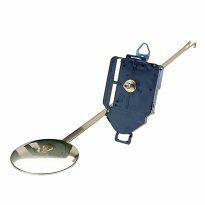 Made from 440C stainless steel, which is used to produce the highest grade of blades and is seldom used in run-of-the-mill knives. 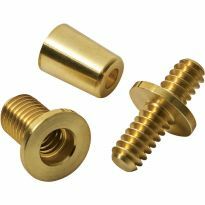 440C is more resistant to corrosion and wear, and is harder than most other stainless alloys. 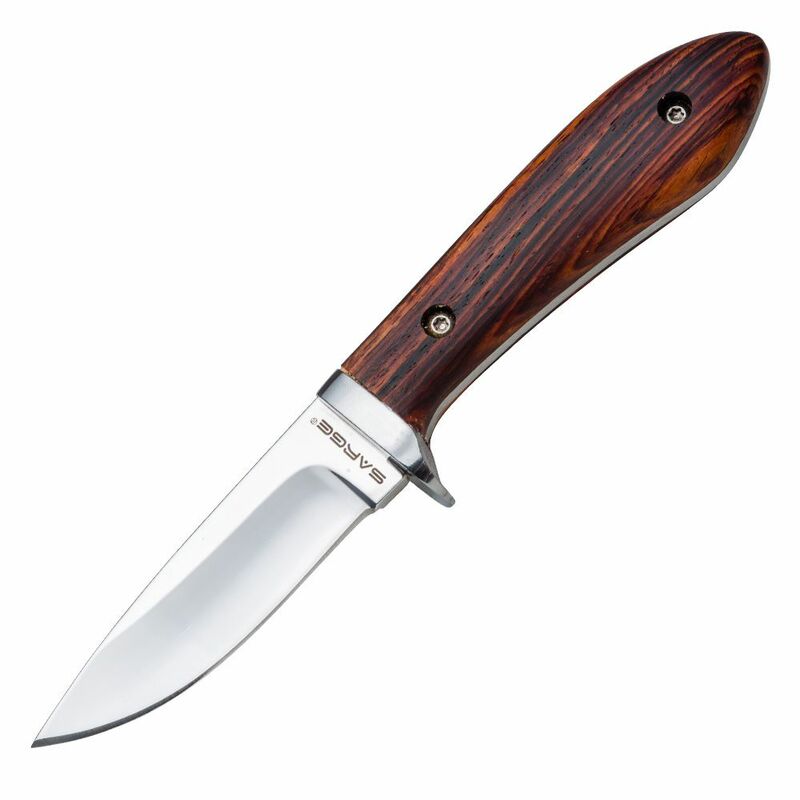 The 3'' drop point blade is accentuated with polished bolsters and a polished finger guard. Ships standard with a genuine leather sheath. Take it along on your next pheasant hunting trip, or gift it to a friend. My father and I built two of these as a project to do together during one of his visits to my home. We chose contrasting scales and love the look! 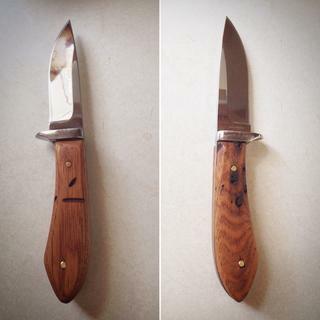 Dad is 73 and has only minimal skills with woodworking, but he was able to do a great job on his knife. Another great kit from Sarge and Rockler. The only downside I've seen with this kit is with the provided pins. They are a tad too large for the holes in the tang. I've had to resort to either drilling the holes out to accept larger pins, or have used screws to aid in joining the scales. The size is the perfect length for a buck knife. Super sharp blade. Better than my $70 Buck brand knife. I made these for all my hunting group and everyone loves them. Bought this from our local Rockler shop for my 13 y.o. dd to make. She picked a beautiful piece of curly maple to make the handle from. It appears as if the review that talks about the difficulty with the rivets has been resolved as they have included a set of rivets that fits taped to the back of the package. Thanks for having this nice project piece. Great home school project! She will be putting this into the county fair and hopes to get a ribbon! 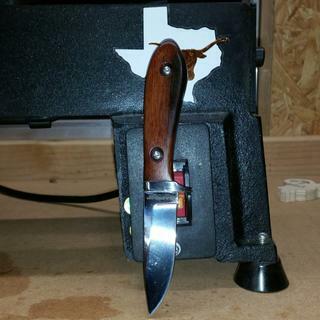 Perfect knife for birds and small game. Looked great and came out very nice. Family members want it. Made with black ebony and brass pins. The only reason I gave it a 4 and not a 5 was because of the name stamped on the knife and the sheath. I like them plain with no advertisement. This is my first knife kit so nothing to compare it to. The knife is nice and seems to be well made. I guess I did not follow the directions or maybe it was I did not understand them so the screws that you mount into the scales were not long enough, so I wound up epoxying them in the holes I drilled. I used Ebony Macassar Knife Scales from Rockler. I do not like the color of the sheath or the name imprinted on it, so I will dye it a darker color. Over all I am happy with the kit and will attempt another one. A very nice knife kit but the sheath required some work to make the knife fit properly. I experienced the same issues as the first reviewer but handled them a little differently. Both work , thought I would pass along. I found the same weld interference where the bolster attached to the tang. But, I filed the back of the scale rather than the weld. It took just a few seconds and doesn't affect the structural integrity of the knife. I also found that the 5/32 drill bit was too large for the hole in the tang. I switched to a 9/64 bit. It fit the hole in the tang and accepted the longer pins (the one's attached to the back of the knife package). I made 6 knives with either cherry or maple scales. I think the cherry produced a better looking knife. 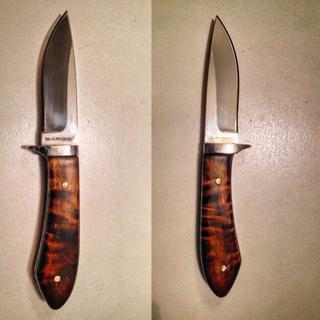 I also stained the sheaths dark brown. Looks much better and hides the "Sargent" stamped in the sheath. I did two without using any pins. Just Epoxied the scale to the knife handle. Looks very clean and appears to be plenty strong. Hope these comments help. Makes a beautiful little knife when completed. I like the knife kit other than the logos on the blade and sheath. Also, the kit I received, the holes in the tang were only 1/8" instead of the 5/32" in the instructions. Ended up reaming the hole to 9/64" to get the screw sleeves to fit. I had already epoxied the scales on and shaped them when I realized the problem as the drill bit pulled the scales off when It could not go through the tang. Several hours wasted. I have already made three of of the folders and they turned out great. (No sheath). But to keep showing the fixed-blade knifes with a blank sheath kits,and then to receive it with a logo stamped on the sheath is false advertising, especially when you've already had many reviews stating this. 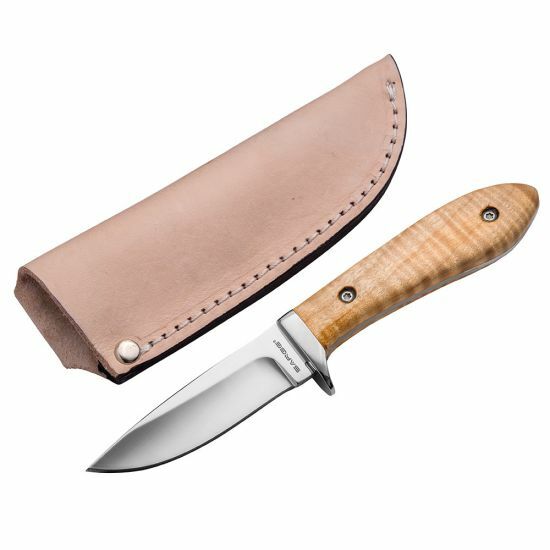 Either take a new picture for your add or get the manufacturer not plaster a logo on the front of the sheath. READ BEFORE YOU BUY OR BEGIN WORKING ON!! Nice knife but found a couple of flaws, one of which was after it was too late; so if you're buying this knife read this review. First the weld where the bolster connects to the tang prevented the scales from fitting flush against the bolster. Had to file them down. Not too bad but be careful not to groove the bolster. Second, I cut and attached brown mallee burl scales. Drilled the 1/16" holes as instructed. Shaped the handle and drilled the countersink. The next step requires a 5/32" hole drilled through however the holes in the tang are smaller and I trashed 3 drill bits trying to drill the very hard 440 stainless steel. I first ruined an oxide bit not realizing the problem. I then ruined a cobalt bit which was supposed to do the job and then a titanium bit which drilled the 2 holes in one knife and 1 in another before burning up. I finished the last hole with a diamond encrusted carbide bit. Worked well. The problem is the heat from drilling compromised the CA glue I used to adhere the scales to the tangs and they separated from the tangs. I would have used a drilling oil to keep the temperature down but figured it would stain the wood. Didn't expect it would get ruined anyway. Frustrating but valuable lessons learned. So if you're buying or bought this knife check the holes in the tang to ensure they are 5/32" and if not drill them with a diamond encrusted carbide bit before attaching the scales. The connector sheaths will not fit the smaller holes, in fact they fit the 5/32" holes snugly and will need a little persuasion to fit in. Be sure to file down the lips created from drilling the holes bigger so your scales fit flush against the tang. It would be nice if there was some quality control at Rockler. This should have been caught. Not happy about ruining brown mallee burl. Would have rated 4 stars if not for the problems the latter of which could have been avoided had I checked the hole diameters prior to attaching the scales. So some of that is on me. Lessoned learned. 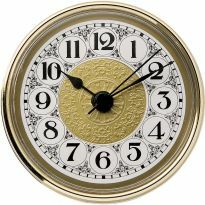 thought it would be a fun project, I signed up for free shipping be it looks like I am being charged a shipping fee. To make a gift for my son, the outdoorsman. I collect knives but never made one. Wanted a small fun project, thought a straight blade knife kit would be fun. Liked the design and purpose. Would like to see a fishing knife kit. 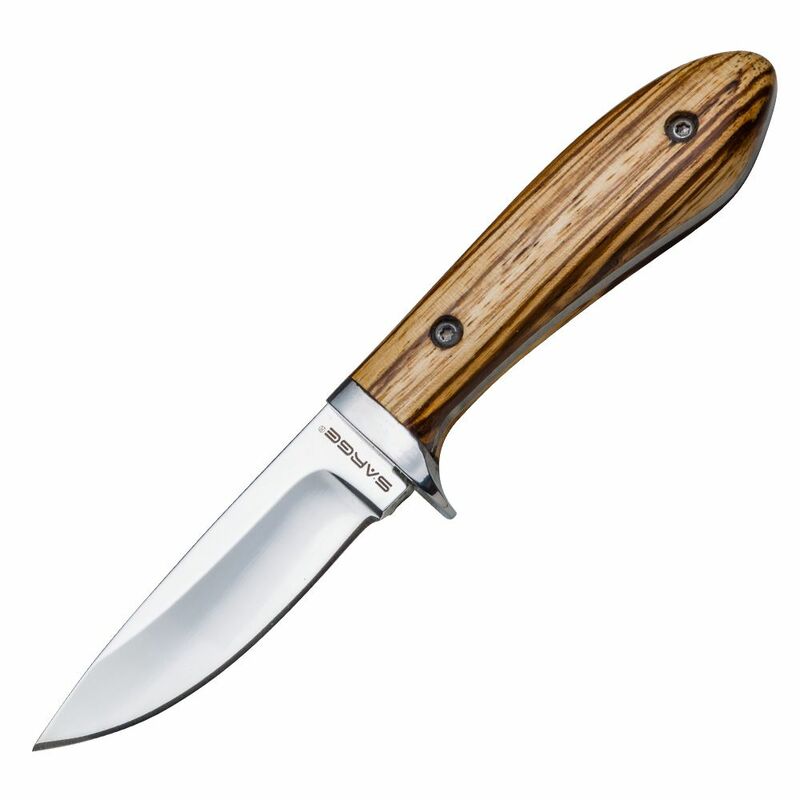 Great Price and will make a great first knife project. I WANT TO MAKE THEM FOR SONS AND GRANDSONS. These are nice knifes. This one was fun to build. 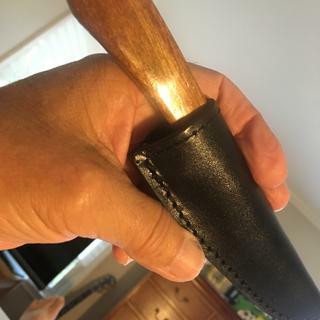 Is the leather sheath finished (dyed) and sealed or does that also have to be done? BEST ANSWER: the sheath is naturally tanned, Ie not colored can be utilized ad purchased. 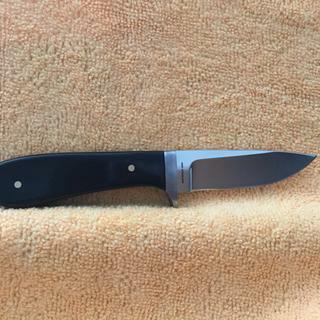 I found mine to be somewhat stiff, I rubbed some neetsfoot oil ( base ball glove softener) placed the knife fully into the sheath and after drying found it to be an excellent fit. It is pretty bare. It looks sealed on the outside though. 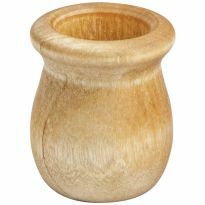 I typically leave it natural and use a wood burner to put initials in it. I dyed mind dark brown. 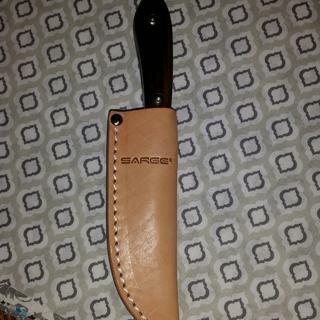 It hides the "Sargent" logo and produces a nice rich looking sheath. Do these kits come with hardware to attach handle? Yes, you get either pins or screws and an allen wrench. You do not get the wood.